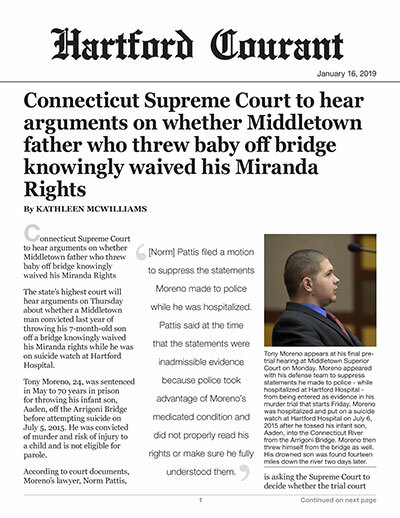 The state’s highest court will hear arguments on Thursday about whether a Middletown man convicted last year of throwing his 7-month-old son off a bridge knowingly waived his Miranda rights while he was on suicide watch at Hartford Hospital. Tony Moreno, 24, was sentenced in May to 70 years in prison for throwing his infant son, Aaden, off the Arrigoni Bridge before attempting suicide on July 5, 2015. He was convicted of murder and risk of injury to a child and is not eligible for parole. According to court documents, Moreno’s lawyer, Norm Pattis, is asking the Supreme Court to decide whether the trial court incorrectly denied a motion to suppress Moreno’s statements from his hospital bed. He is also requesting that the Supreme Court decide whether the missing portions of the interrogation video violate state law. During the trial, Pattis said that police interviewed Moreno at Hartford Hospital just 14 hours after he jumped off the bridge and was pulled from the Connecticut River badly injured and unconscious. Pattis filed a motion to suppress the statements Moreno made to police while he was hospitalized. Pattis said at the time that the statements were inadmissible evidence because police took advantage of Moreno’s medicated condition and did not properly read his rights or make sure he fully understood them. Video footage of Moreno during the interrogation shows him wearing a neck brace and with an oxygen tube under his nose. His eyes are swollen shut and he has IV tubes coming out of his arm. Pattis also argues that police did not videotape certain parts of their interrogation of Moreno while he was still hospitalized. State law requires that interviews in certain criminal cases — like murders — be taped depending on where the interview is held. A hospital is not explicitly named as a location that requires a recording. In his denial of Moreno’s motion to suppress his statements at trial, Judge Elpedio N. Vitale said Moreno was alert and displayed a normal decision-making process when police say Moreno admitted throwing the baby off the bridge.